From the Official Facebook page for Neil Giraldo. Guitarist, Producer, Arranger, Songwriter & Multi-Instrumentalist. Neil 'Spyder James' Giraldo, has been a professional musician, producer, arranger and songwriter for over four decades now, changing the face of the pop charts throughout the 1980s with his collaborator, muse and wife, Pat Benatar. More than just an explosive steel-bending guitar player, Giraldo’s innovative vision helped him create the signature Benatar sound, from its inception. Giraldo began his career in 1978, as a key member of the Rick Derringer band, after beating out 200 other guitarists for the position. It wasn't long before Rick discovered Neil’s piano-playing prowess and quickly put those skills to work in the studio as well, while recording Guitars and Women. Shortly afterwards, the world was introduced to Giraldo and Benatar’s enduring partnership and rock ‘n’ roll love affair via her platinum 1979 debut album, In The Heat Of The Night, which included the classic “Heartbreaker”, as well as the Giraldo-penned hit, “We Live For Love”. The following year, Benatar and Giraldo cemented their place in music history forever, by being the first female and first guitarist, respectively, to ever appear on MTV, with the video for “You Better Run”, taken from 1980’s Crimes of Passion – an album that also included the Grammy-winning, gold-certified single, “Hit Me With Your Best Shot”. 1981’s Precious Time outdid its predecessor and with Giraldo now officially at the helm as producer, it delivered a second Grammy for Benatar. The Giraldo/Benatar partnership continued to be an increasingly unstoppable force with Get Nervous, which featured yet another Grammy-winner, Shadows of the Night. After their wedding in 1982, the pair released their biggest hit yet with the Grammy-winning “Love Is a Battlefield”, taken from the Live From Earth album, which featured Giraldo’s most innovative production to date, creating a thundering, rock ‘n’ roll soundscape out of what had started as a somber, acoustic demo. They closed off the decade with 1989’s True Love – an ahead of its time, ultra-stylized recording for the contemporary market, inspired by the sound of the Count Basie Band - one of Giraldo's piano-playing idols - and by the Big Joe Turner/Roomful of Blues record, 1984’s Blues Train. Neil Giraldo was born in 1955 in Cleveland, Ohio. Eternally immersed in the Sicilian culture of their ancestry, parents Anthony and Angela bought Neil his first guitar at the age of six, in the hope that he and big sister Priscilla might serenade the family with songs from the old country. Neil's Uncle Tim, who was only four years older, had different ideas, however, and introduced Neil to bands like The Yardbirds, The Kinks, The Rolling Stones and all the other great guitar-driven rock ‘n’ roll bands of the 1960s. It was a move that was to change Neil’s path forever. Today, Giraldo’s career is as dynamic as ever, as he is in the process of completing two books – one an auto-biographical novel, one a coffee table book - as well performing in a new band project with Scott Kempner from the Del Lords/Dictators and Ron Young from Little Caesar. He is also further expanding his Bel Chiasso entertainment company, which develops a variety of television and film projects. In addition, he has also opened up his large vault of unreleased, unfinished songs and will be completing and releasing various new tracks with Benatar, as well as with other artists, in the coming months. As their thirty-three-year anniversary approaches, Benatar and Giraldo still hit the road every summer, thrilling audiences just as they always have. Whether, it’s in support of the vocal, or a guitar solo, or jumping from piano to guitar and back again, Giraldo’s gift is knowing how to always up the power in a song, increase the excitement and keep himself and Benatar as creative as they’ve ever been. 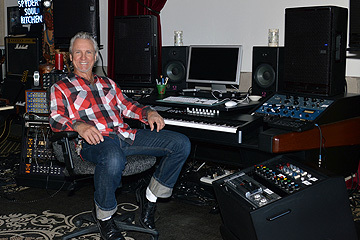 Neil Giraldo in his home studio in Malibù (Autumn 2013).